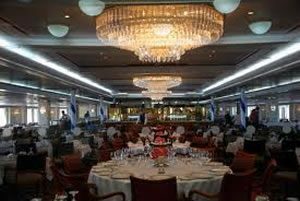 We are so pleased to let you all know that our ‘Farewell Voyage’ aboard the magnificent “Saga Ruby” was absolutely tremendous, right from the moment the chauffer driven Saga limousines picked us up from our front doors to the moment they took us home again. You know, it’s such a great feeling when you arrive on the quayside to find all those other wonderful Maritime Memories people, there to greet you. On this occasion there were those who have sailed with us so many times and others joining us for the very first time, but within minutes everyone was as if one… that’s one of the things that makes these voyages so very special. 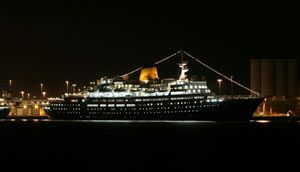 The classic lines of the “Saga Ruby” looked fantastic and so different from the other cruise ships all huddled together like some kind of unsightly housing estate! Yes, we had no envy for the hordes of passengers queuing up to board those other ships, for we were on the ship of our choice, a real ship that was about to take us to sea in much the same way as we used to in the ‘good old days’. Whistles blew as we slipped our berth, the Captain turning the ship’s bow so she could steam supremely down the Solent. As I stood on deck watching Southampton fall away behind us, I thought about all the famous ships in the past that had started their voyages in similar fashion; Royal Mails’ Alcantara and Andes, Cunard’s Aquitania, Queen Mary, Elizabeth and Caronia, the P&O liners, Arcadia, Iberia, Himalaya, Oriant Line’s Oronsay, Oriana, Orcades. The great lavender-hulled liners of Union-Castle: the Capetown Castle, the Edinburgh, Pendennis and Windsor. 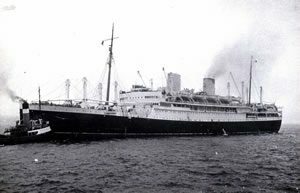 Shaw Savill’s Dominion Monarch, Southern Cross and Northern Star, White Stars Olympic and of course the ill-fated Titanic… plus all those oh so many ships including BI, French Line, NZSco, Italian Line, Holland America… It was a maritime vision that went almost without end. 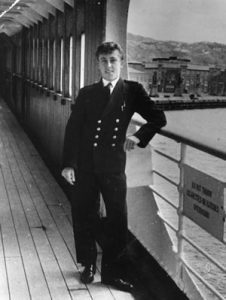 Then I remembered the time when as a young writer aboard NZSCos old “Rangitata”, we were berthed alongside the then totally splendid “Ocean Terminal” (What a terrible mistake it was getting rid of that!) having just stopped for a few hours on our way to London from New Zealand, to disembark passengers. As you can imagine, after a lengthy voyage it was quite hectic aboard as we tried to disembark all our passengers and luggage, and still sail on the noon tide and at such times, life never got much more chaotic than it did for the Purser’s office as we dealt with every problem imaginable. Of course, back in those days we didn’t have all this modern technology like computers and mobiles in fact, we only had one phone link to the shore, which was installed in my office just for the few hours we were alongside until we sailed. We left our berth at 1200 hrs only to find ourselves steaming down the Solent side by side with the mighty “United States”. With that we both continued to steamed side by side down the Solent, the mighty, super speedy, all shiny new, 53,000 gross tons “United States” even more super 40 knots speed frustratingly tethered to what I think was a more stately 8 knots Solent speed restrictions, enabling our rather ancient, 1929 launched, 16 knots Rangitata to hold her station with pride. 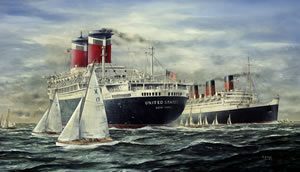 Sadly I haven’t got a photo of this amazing event but I can give you some kind of idea of the scene by showing you this painting by Robert Lloyd of the United States and Queen Mary passing further down the Solent. As I stood and watched this debacle the sounds of the Harbour Master’s voice range clearly through me tired little brain. I lit a cigarette and took a long, calming drag, and then slipped away into somewhere invisible, which I thought was probably better for my career than actually owning up to being the one responsible. I understood that all hell was let loose over the incident with everyone blaming each other, but until today… no-one ever knew that I was to blame, so please do keep it to yourselves. 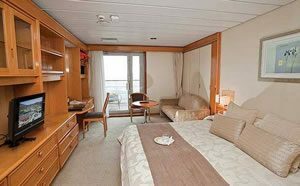 Now I’ve got completely carried away on my little journey down memory lane, but then isn’t that what Maritime Memories is all about anyway and boy, did we hear some great stories during the length of our 12 night voyage. I always refer to them as voyages and not cruises because I feel it more in keeping with everything we do, as we chuck out all the old modern ‘Politically Correct’ stuff and all the other rubbish that has managed to find its way into our lives and endlessly gnaw away at the happiness and freedom we all so used to enjoy. 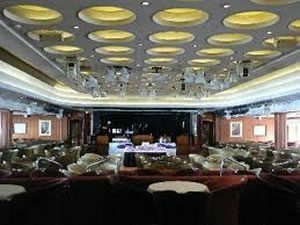 It was a fantastic trip; the ship was beautiful, the food second to none and so, so much to do, not that us ship people really need to be entertained, although we did so enjoy our own special Maritime Memory get-togethers, which incidentally, everyone aboard just absolutely loved coming to. We had lots of nice port visits as we made our way from Southampton to Madeira, which is such a nice place these days, and then on around the Canaries ending in Agadir in Morocco, which had changed beyond imagination since I was last there; instead of deserts, tents and camels, it was so clean and although modern, still in keeping with the traditional architecture of the country and, although late November and early December, the sun stayed with us all the way and would you believe, all the way back across the dreaded Bay of Biscay to Southampton. You know with Maritime Memories we really do try to recreate life aboard as it would have been during the golden age of ocean travel and this voyage, which was supposed to have been the Saga Ruby’s penultimate voyage, was no exception and so to end it on a high note, we arranged our own special Fancy Dress Farewell. 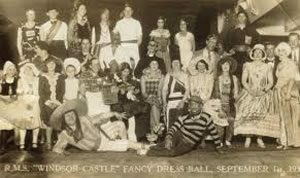 Now there was some concern aboard amongst senior staff, who worried that such an event would be nothing short of a disaster, especially as the evening before they had asked all the passengers who were taking part in the fancy dress to put their hands up and only four did. They wanted to cancel the event but, being an old seafarer with lots of experience including sailing down the Solent! I urged them to have faith because I was sure it would be ‘Alright on the Night’. Yes, it really was just like the old days and what they thought would be impossible, was tremendous and everyone, including all the ship’s crew did us proud. 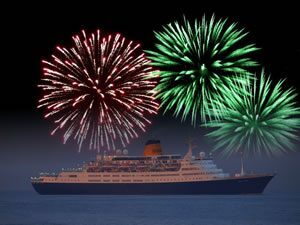 Quite honestly it was an evening that few aboard will ever forget for we played party games, drank copious amounts of booze and partied until the early hours. I lost count of how many very elderly people were carried legless to their cabins that night, but one thing I do know… they were all taken magically back in time to an age when life was just so much more enjoyable, and they all had one of the best nights of their lives… Isn’t that what Maritime Memories are? So another voyage of Maritime Memories finally came to an end and as we slowly made our way up the Solent on a cold, misty December morning, we bid farewell to all the other wonderful Maritime Memories’ people and indeed, to all the hundreds of ordinary passengers who also wanted to be part of us. These new friendships were not just passing ships in the night but special friendships that would last forever, as would the wonderful memories we all took away with us of what was a truly special ocean voyage. I don’t know about you, but I think I’m really looking forward to the next one now!